CHARLOTTE, N.C., Feb. 28, 2012 (SEND2PRESS NEWSWIRE) — Jackie Fame (www.JFame.com), which bills itself as the “kid/teen social network,” a Facebook alternative for kids and teens, announced today the launch of its most anticipated FAME 2.0 social network. Jackie Fame is an investment capital funded, Charlotte and Los Angeles based company. 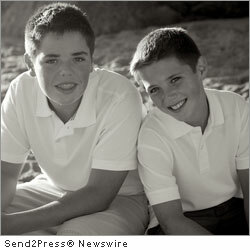 Jackie Fame, founded by kid entrepreneurs Zachary Swauger (age 13) and Joshua Swauger (age 10), launched its initial Jackie Fame Network in January of 2011. After the positive response and tremendous membership growth, the brothers put a halt on growth initiatives while focusing on enhanced development efforts of its platform. With continued feedback for improvements from the FAME Kid Advisors, the brothers developed FAME 2.0 – a custom, feature rich, with a scalable network, infrastructure. Also, not surprisingly, Jackie Fame offers an interactive Android and iPhone mobile app available to download for free on over 2,500 wireless devices – FAME Mobile. In 2011, the Swauger brothers also penned their first book in the “Kid2Kid Book Series” titled “Kid2Kid, Keepin’ It Safe Online” (ISBN: 9780615500256). This fun to read book about internet safety, which includes a chapter on anti-bullying, is now available at book stores, Barnes & Noble, Amazon, and public libraries. As a complement to the book, they also launched their anti-bullying site “We Have the Power” – www.WeHaveThePower.net – which is a grass-roots effort encouraging kids to join together in the fight to end bullying. “What we set out to do was build an awesome place on the web for kids to communicate, share and create new friendships, continue to develop our brandFAME and its superior lines of quality products, provide financial opportunity for our investor team, and prove to the admission officers at Stanford University that we have what it takes to be a Cardinal – in about 5 years,” said Joshua Swauger. Jackie Fame’s BrandFAME will initially launch with the FAMEbody “body treats” personal care line and FAMEnails, the companies nail polish line, due to be in national retail store locations by Q4 2012. BrandFAME, the company’s apparel line is expected in stores by Q1 2013. All lines and been developed, branded, quality tested, and are now in the pre-sale process. The Company continues to expand its Jackie Fame brand with the national retail launch of the “FAMEbody” personal care and cosmetic lines (www.ReadySetWow.net), BrandFAME apparel lines, www.FAME50.com merchant platform and Face-the-Fame; FAME America! the online music & talent contest for kids is launching in 2012. To learn more about Jackie Fame network, please visit http://www.JFame.com . The Mission of the Jackie Fame Network is to be the leading kid/teen social networking destination with the largest, most engaged audience and community. The network will be supported by its unique position as one of the strongest, most valued brands focusing in the highly coveted kid-teen audience. Jackie Fame is a privately held company and is headquartered in Charlotte, North Carolina. Jackie Fame®, FAME50®, JFame®, FAMEbody®, and Face-The-Fame® are registered trademarks of Jackie Fame, Inc. All other trademarks acknowledged. - Photo Caption: Zachary and Joshua Swauger. News Source: Jackie Fame, Inc. :: This press release was issued on behalf of the news source by Send2Press® Newswire, a service of Neotrope®. View all current news at: http://Send2PressNewswire.com .